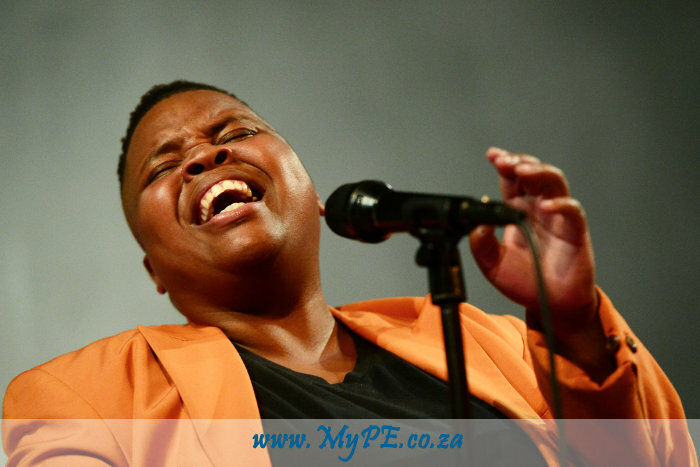 Powerhouse jazz vocalist Asanda Mqiki celebrates debut solo album with an SA and Mozambique tour. The long-awaited solo album of Asanda Mqiki, one of Port Elizabeth, South Africa’s most talented and versatile vocalists, has finally dropped. It’s news that will thrill local and international fans alike (pre orders have been received from the UK, Nigeria, New Zealand and the USA). The album entitled ‘Nobakithi,’ comprises nine tracks (two of which are radio edits). Seen by many as an Afro-Jazz artist, the album showcases the eclecticism of Mqiki’s musical style. Her voice soars, then murmurs, then scats like she’s Ella’s daughter. The songs range from soul to funk to reggae to jazz to contemporary traditional African… it’s a hard one to try and box in but, it is certainly an album that will be treasured by her fans – and sure to bring her many more. Mqiki is renowned for her on stage presence and energetic performances. It made perfect sense therefore, for ‘Nobakithi’ to be recorded live in front of an enthusiastic audience, at the Savoy Theatre in her home town of Port Elizabeth. The album is subsequently imbued with signature Mqiki magic but, it also contains the polish and quality of a studio sound thanks to the work of sound experts Lineout Productions & F# Music. The Album begins with ‘Mbulelo’, a tribute to Mqiki’s parents and their ancestors, that contains driving traditional rhythms and features mbaqanga guitar playing by Ben Badenhorst. ‘Nobakithi’, the title track and co-composed with drummer Thoba Goba, is the story of a young girl who leaves home to make it in the big city. Like many before her, she makes mistakes but is reminded that she can and should always, come home. ‘I’ve Got You’ is a Mqiki classic – a love song of pure happiness. ‘Naughty Pirate’ delves into the fun side of Mqiki’s song writing abilities; dedicated to a generous donor from her crowdfunding campaign and co-written with his partner, it’s a reggae, almost cumbia inspired song that draws on Qaqambile Qingana’s considerable synth skills to create a track unlike any other on the album. ‘China Chino Funk’ opens listeners to Mqiki’s jazz-funk roots and lyrics that are entirely scatted. ‘Caramello’ is a cheeky number, written for Mqiki’s partner, and is a hit that gets the audiences on their feet every time – and is often the requested encore. ‘Take Six’ is Mqiki’s evolution of the classic Take Five, and another nod to her jazz background, incorporating isiXhosa lyrics. The two radio edits are ‘Mbulelo’ and ‘Nobakithi’. All songs feature the full band: Thoba Goba on drums, Mthokozisi Mabuza on keys, Qaqambile Qingana on synths, Grant Allison on electric bass, Joash Soobramoney on saxophone and Kamva Goba on percussion. Guest guitarist Ben Badenhorst makes an appearance on two tracks as well. The album was released on 7 September and is available for digital purchase and / or streaming across platforms including iTunes, CD Baby, Google Play and Spotify. Physical CDs can be ordered via www.asandamqiki.com. “Since I went solo in 2013, I have looked forward to the time when I could record my music, sharing it with as many people as I can. This album is a tribute to the rich tapestry of where I have come from and the people whose lives have woven their stories with mine to build the current picture. I’m very grateful for the support of Arte Viva Management, Networx PR and everyone else who has made this possible. Brenda Sisane, Kaya FM: I hear a wonderful storyteller who does justice to any lyric due to her amazing vocal ability. I am thankful to hear that isiXhosa singing vocabulary only found amid those lush hills of the Eastern Cape in her voice, on the first and second tracks. The versatile 80s funk soul reach of her voice makes her a versatile performer….it is tracks like Take Six that showoff her vocal improvisation skills with a rooted personality. I would play it to friends and lovers of music anytime. Asanda displays elegant and colourful charm in this album-using her voice in a discerning and entertaining manner. Jane Mayne, Weekend Special: Asanda Mqiki makes a welcome contribution to the heritage jazz tradition with the launch of a compelling debut solo album, Nobakithi…. Nobakithi springs from a genuine, inventive space. Praiseworthy music that makes one a keen participant anticipating the next step in Asanda’s boundless artistic journey.